Today I'd like to share with you all a fun banner I made in the Spirit of Teacher Appreciation Week. The day the Design team shares their challenge projects with you all! 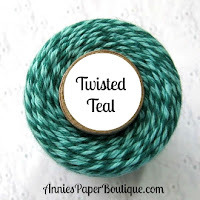 This month we are showcasing the "Teals" over at Trendy Twine. For my project I have used Twisted Teal. It's such a pretty color and I really loved how it popped with the Kraft. I've created a tag for Mother's Day. This could go on a bouquet of flowers, a package or even a card. 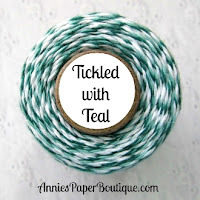 You can grab the teal's on sale now in the Trendy Twine Store .. click HERE for the May specials. Today I'd like to share with you a fun project that I've made for one of my son's teachers for Teacher Appreciation Week. We are blessed to have three fantastic teachers this year and it only brings me joy to create something for them! Today's post is about my first creation .. a small notepad with a fun matching pen. I thought the notepad could easily fit in even a small purse, or sit on a desk to jot down some reminders or a to do list. I hope that this has inspired you to make something fabulous to say "THANKS" to all your favorite teachers. They all work so hard .. for OUR children .. it's the least we can do. PS .. If you LOVE twine as much as I do .. check out the Trendy Twine Store and pick some up! Lemon Tart is even on sale .. but it ends soon .. so grab it fast! How is April treating you so far? Me?? Fantastic! I've had a visit from family AND I'm sunning it up in Hawaii! Yeah for sun! 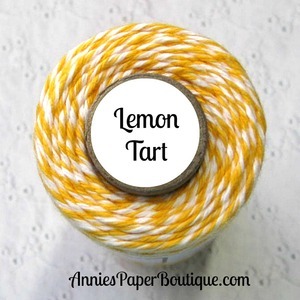 This months challenge over at Trendy Twine is one that is sure to brighten your day! I mean ... doesn't YELLOW make everyone happy, happy, happy? This month we are featuring my ALL TIME favorite color ... Lemon Tart! ~ Misc flowers, buttons and butterfly. I hope that you will consider joining us in this months challenge! Today I'm sharing a cute little card with you that I've made using some of my copics. I stumbled upon a new digi stamp company. I immediately fell in love with their stamps and had to use one right away. Here is the little cutie I have to show off. Today I'm sharing a project that I've created for the Trendy Twine Challenge for the month of March. Well ... here in this house .. all the men are Irish so we feel it's ok to celebrate EVERY day! I used three different embossing folders to add some dimension to the tag. Keep your eyes open for the next challenge coming your way soon HERE. It's monday .. and that means a brand new challenge is starting up at Little Scraps of Heaven Designs. You can see all the details on the challenge, how to enter, and prizes offered HERE. Thanks so much for stopping by today and I hope you'll enter this weeks challenge at Little Scraps of Heaven! Again .. you can find the details on the challenge HERE.